This is the website of Swami Saradananda, internationally-renowned yoga and meditation teacher and author, who inspires you to want to practise. Her classes and books are practical as well as theoretical in nature – and always enlightening! Among the books she has authored are "Relax and Unwind with Yoga", "Chakra Meditation", "The Essential Guide to Chakras" “The Power of Breath”, “Mudras for Modern Life” and “The Cleansing Power of Yoga”. Share Swami Saradananda's knowledge and experience, gained in more than 40 years of practising and teaching yoga. As you deepen your yoga practice and craft a yoga lifestyle for yourself, she can help you to better share that experience with students. Never stop practising - this is the mistake that most teachers make. They get so caught up in teaching and giving to their students that they forget the importance of recharging their own energy. PRACTICE - PRACTICE - and then PRACTICE some more. A good teacher always teaches from her own experience! For 26 years Swami Saradananda worked with the International Sivananda Yoga Vedanta Centres and ran yoga centres in New York, London, New Delhi and the Himalayas. In 2001, she took a sabbatical to do personal practice in the Himalayas. 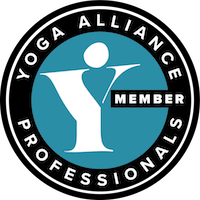 Upon returning to the West, she was the 'author in residence' at the Peacemaker Community in Western Massachusetts, and then became the spiritual director of Haus Yoga Vidya, just outside of Cologne, Germany. Since 2004, Swami Saradananda has been a free-lance yogi, living in London and teaching in various parts of the world. She currently working on an MA in 'Traditions of Yoga and Meditation' at SOAS (School of Oriental and African Studies), University of London - and occasionaly take groups to India. Click here to contact Swami Saradananda. In addition to her own blog, she also write articles for Elephant Journal and Watkins Publishing. 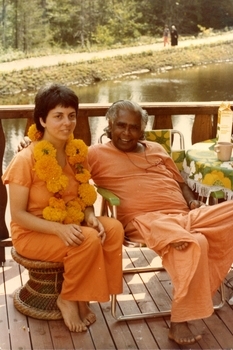 Swami Saradananda with her teacher Swami Vishnu-devananda, founder of the International Yoga Vedanta Centre, who was known to promote world peace as well as inner peace.